I’ve been waiting to declare this scarf finished until after I’d blocked it, but today decided I’d just go ahead and take pictures and if I get around to blocking it later, great. 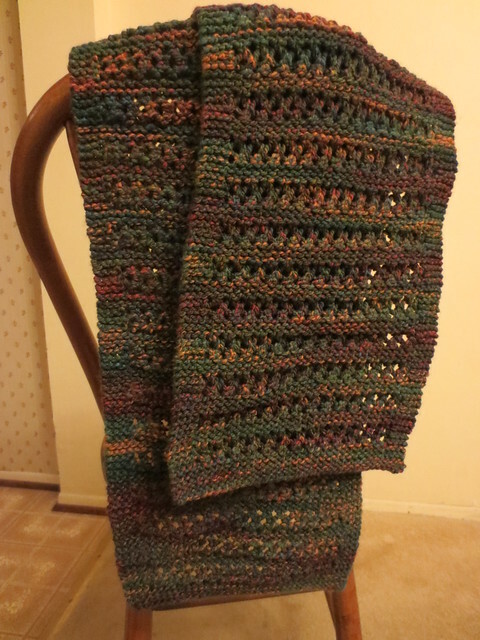 As it is, I can’t quite remember when I started knitting this or when I finished. I’m 98% sure I was working on it in the truck on the drive back from Idaho early this past March, and I don’t think I was very far along because I recall that I kept looking at the pattern, and I know by the time I was done I’d memorized it, so I’m guessing I started it early last year, perhaps on that same trip. I finished it while sitting on the couch in the family room, watching tv, but that recollection doesn’t help me figure out when since I do that a lot of nights. It’s been months, but how many I don’t know. The pattern is by Angela Tong, from Knit Simple magazine’s Winter 2011/12 issue. 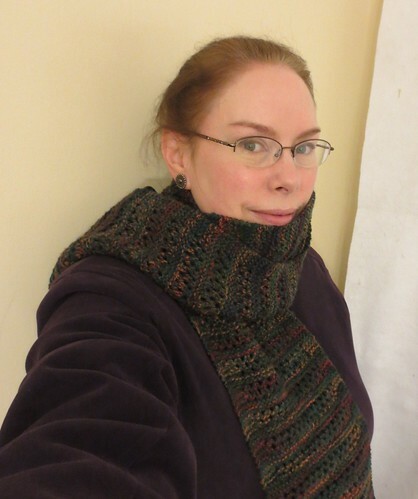 I made some tweaks to it, as I only had two skeins of the yarn (Mountain Colors River Twist in the Pine colorway), not enough to make a whole shawl. Casting on fewer stitches and knitting until it looked like the yarn was going to run out resulted in a nice scarf. Originally I was thinking I’d donate it to the Weetacon raffle, but it coordinates so nicely with my plum colored winter coat (and my couch, for that matter) that I might keep it and knit something else for the raffle.